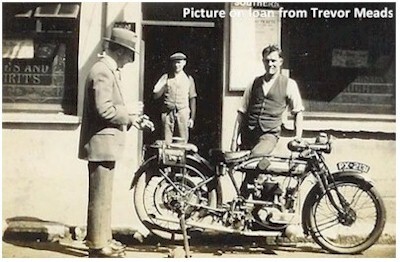 Motor bike picture - Edwin Brunton, son of Landlord Herbert Brunton, holding a motorcycle outside The Selden Arms. 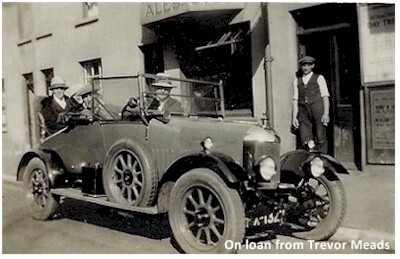 Car picture bottom right - Herbert Brunton at the wheel of his car outside The Selden Arms. John Fuller sent me this email . 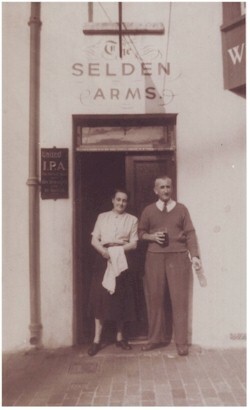 . .
My parents, Jim & Peggy Fuller, were landlord & landlady of the Selden Arms from 1952 to 1968. They took it over, I understand (I was only 16 months old), on 6 Feb 1952, the day King George VI died and we moved out around Oct/Nov 1968 when I had just turned 18 and was finally old enough to drink! I came across the attached photo of mum and dad and thought you might like to have it for your site. We think it must have been taken shortly after we moved in. Jim & Peggy have both since passed on, but I'm sure there will be many who will remember them. 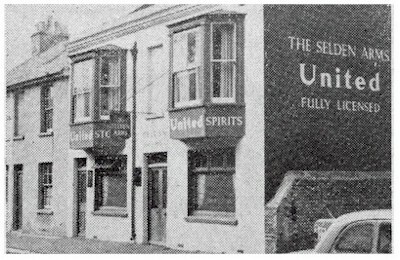 They were friends of Sam & Nel who ran the Hare & Hounds during the 50s & 60s. 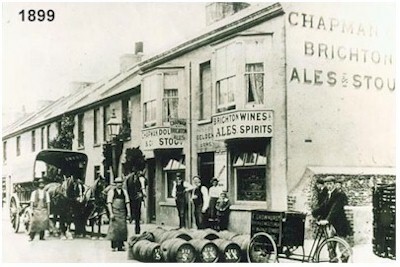 I had heard it mentioned that the landlord of the Selden decided to move to another pub during the war. 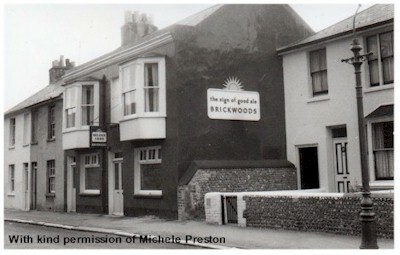 His reasoning was that the pub was far to close to the gasometers for his comfort, a prime target for the German bombers. The pictures above seem to bear out his fears. On October the 8th 1940, two houses were destroyed by bombing - just four doors west of the pub and slightly north to the origin position of the gasometers. 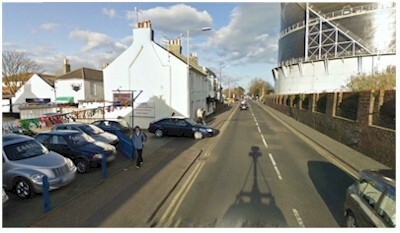 The picture on the left shows the scene today, the houses destroyed were never rebuilt. Today the space is occupied by a second hand car dealership. 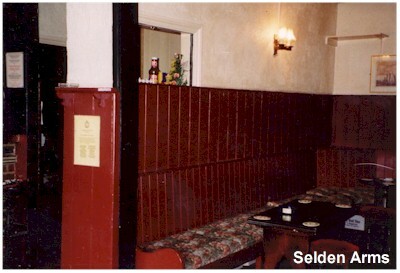 This is how the Selden looked just after Michele and Bob took over. The 'look' didn't last long, as a refit was long over due. 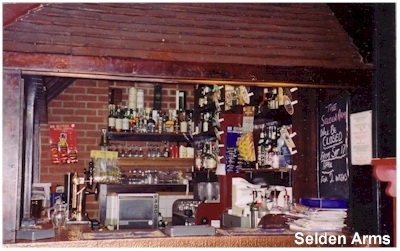 However, it reflected style of the time, the classic titled roof over the bar giving a cottage feel. With the copper bar top and pew type bar seats in wood panelled recesses. . . it was all the rage! 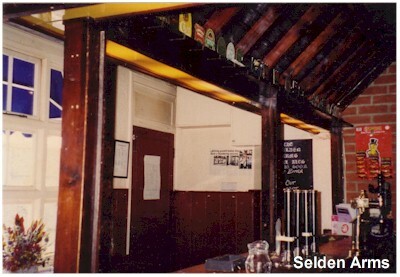 The Selden remains a single bar, (it did previously have an off licence or 'Bottle & Jug' as they were known). Today, this 'just out of town' pub is a cosy, non-jukebox, real ale treasure trove - not just because it's my local when I can get there. 1998 - Michelle Preston & Bob ?